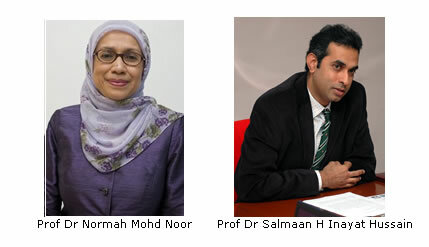 BANGI, 28 June 2012 – Another two scientists from The National University of Malaysia (UKM), Prof Dr Normah Mohd Noor and Prof Dr Salmaan H Inayat Hussain were among the latest of the country’s academics selected for appointment as Fellows of the Academy of Sciences Malaysia (ASM). Prof Normah is the Director of UKM’s Institute of Systems Biology (IMBIOSIS) while Prof Salmaan is the Dean of the Faculty of Health Sciences and Professor of Toxicology. The ASM board made the decision in May but the date for the formal induction ceremony will only be announced later, most likely after Hari Raya Aidil Fitri. Earlier it was announced that the Director of Fuel Cell Institute, Prof Ir Dr Wan Ramli Wan Daud was appointed a Fellow of the Academy at its 17th AGM on 28 April 2012. His formal induction will also be held later. ASM is a statutory government body formed to encourage and heighten excellence in Science, Engineering and Technology for the development of the nation. A Fellow is appointed among Malaysians based on his achievements in Science, Engineering or Technology which are considered of extraordinary merit. Prof Normah’s work on cryopreservation and in vitro propagation of tropical fruit species (especially citrus, garcinia and nephelium) with recalcitrant seeds has resulted in advancement of knowledge about and the techniques for long-term ex situ conservation and micro-propagation of the species. She has also studied the characteristics of baccaurrea species seeds and cryo-storage of their embryonic axes. Additional work involved conservation of nepenthes species (pitcher plants) an endangered species using cryopreservation techniques. Prof Salmaan was a recipient of the Visiting Scientist Fellowship of the Japan Society for Promotion of Science (JSPS-VCC), Visiting Scientist Fellowship to Chiba University, Kyoto University and Okayama University, Japan in 2006. He has done research on the toxicity of Quinone, a class of organic compounds that are formally derived from aromatic compounds such as benzene or naphthalene. He is also an advisory Committee Member of the United Nations University International Institute for Global Health.